Lazy Dog's ahi poke jar appetizer with wasabi dressing. In 1998, Toshi Sugiura, restaurateur and executive sushi chef, launched California Sushi Academy in Los Angeles, the first sushi school outside of Japan. Sugiura rightly believed that the United States was on the verge of a sushi boom. Ten years later, sushi restaurants in the U.S. represent a $3 billion segment, and according to IbisWorld, they have enjoyed an annual growth rate of more than 3 percent over the past five years. Wasabi 2.0. The burgeoning popularity of sushi, driven in no small part by its presence in grocery stores around the country, led to menu crossover of wasabi, the familiar horseradish-like condiment that is its companion. Influential chef Wolfgang Puck used it to flavor mashed potatoes at his seminal Asian-fusion restaurant Chinois on Main, and chains like The Cheesecake Factory followed suit with spiked spuds of their own. A couple of decades later, wasabi adds dash and a bracing dose of flavor to a much wider variety of dishes. The Cheesecake Factory finishes seared tuna tataki salad with wasabi vinaigrette and its seared ahi tuna entrée with wasabi butter sauce. Flying Squirrel, a bar and restaurant in Chattanooga’s trendy Southside neighborhood, serves an eclectic Wagyu Tartare Sandwich topped with fermented potato chips and wasabi crema, and equally trendy Lazy Dog Restaurant and Bar, a 30-unit chain based in Huntington Beach, Calif., offers an ahi poke jar appetizer with wasabi dressing. Togarashi. If wasabi was a door opener, other Japanese ingredients have rushed right through to establish themselves on mainstream menus. 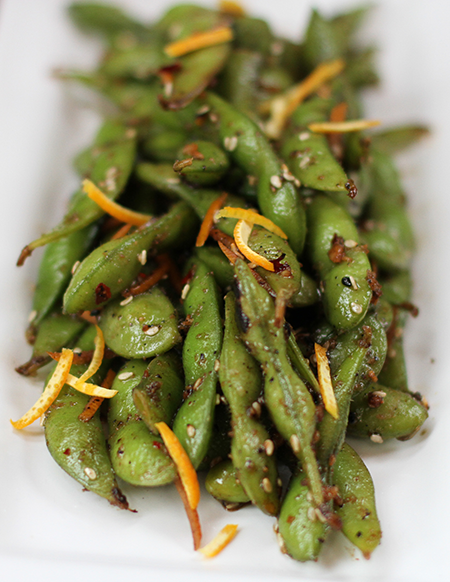 Togarashi is a spice blend of red pepper that also typically includes orange peel, sesame seeds and ginger. It has topped the Black Bass Crudo at Simon & the Whale in New York City, and it wakes up the togarashi edamame (left) at Lazy Dog, along with sea salt and garlic. At Akasha in Culver City, Calif., togarashi seared albacore comes with stir-fried vegetables, turmeric dashi and Thai basil, and at Hand Cut Burgers and Chophouse in Scottsdale, Ariz., tempura zucchini fries are accompanied by togarashi ranch dressing. Outlier, which is located in the Hotel Monaco in Seattle, creates a lunch special togarashi-crusted salmon sandwich with miso aïoli, shiitake mushroom relish and pea shoots. The opening menu at Fine & Dandy in Jackson, Miss., presented updated classics with playful twists like the Caesar-San, an Asian-inflected salad that included sesame croutons, a ramen egg and ginger-togarashi dressing. Furikake. Fine & Dandy’s current menu includes its interpretation of okonomiyaki, a savory Japanese pancake, topped with sweet katsu sauce, ginger mayonnaise and house furikake. The last is another Japanese blend that starts with dried fish to which are typically added sesame seeds, chopped seaweed and MSG. In Austin, The Peached Tortilla delivers street-food-centric cuisine with specialties like an ahi tuna poke bowl, which gets its crunch from cucumbers and cabbage and its flavor from wasabi mayonnaise and furikake; and the Korean steak-and-eggs bowl on the brunch menu starts with sous-vide hanger steak, to which are added sunny-side-up eggs, kimchi, rice and furikake. Bowls form the backbone of the menu at Legal Fish Bowl, the fast-casual offshoot of Boston’s venerable casual-dining chain Legal Sea Foods, where the Tunanimous Choice bowl comprises sesame ginger tuna poke with jasmine rice, seaweed salad, charred broccoli, kimchi, radishes and poke sauce. The topping of nori furikake provides texture. At the 34-unit Just Salad chain, diners can choose the Tokyo Supergreens Salad topped with either grilled chicken or organic sesame tofu. Both come crowned with roasted almonds and furikake. Miso 2.0. Miso, which is made from fermented soybeans, is a staple in Japanese pantries and a prized delivery vehicle for savory umami flavor. Casual-dining chain Kona Grill plays it straight with traditional miso soup made with tofu, seaweed and chopped green onion, but other contemporary dishes reflect an East-meets-West play of sweet and savory. The miso grilled carrot at Gunshow in Atlanta is topped with salted Japanese plum and carrot butter, while The Peached Tortilla’s Asian pear miso salad combines baby kale and mixed greens with overnight pear kimchi, a radish duo, herbs and miso-pear vinaigrette. And specialties at Sugarbloom Bakery in Los Angeles include miso butterscotch cookies made with white miso and white chocolate, and a sophisticated white miso kouign-amann, a classic French pastry whose laminated dough at Sugarbloom is layered with butter and white miso.